Alan Pardew has claimed Newcastle United will enter this new Premier League season with renewed optimism because Mike Ashley listened to him in May and realised he had to spend money this summer. The manager insists he has “nothing to moan about” as he begins the campaign with seven new faces. While in truth the club have more or less only spent the revenue raised by the sale of Yohan Cabaye and Mathieu Debuchy, the club’s owner has loosened the purse strings. Pardew said he was “lucky” to have the relationship he does with Ashley and he would be happy if no other player was signed before the transfer window closes. The hope now is all this pre-season positivity will transfer on to the pitch, beginning with Manchester City’s visit to St James’ Park on Sunday. 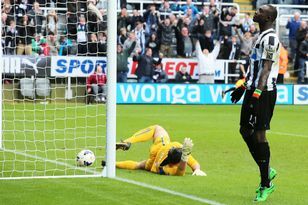 Pardew said: “I can sense a positive mood on the training ground and I’m confident that will be replicated in the stands. “We have more depth and more quality and when I signed a long contract with Mike and the club we both knew there would be ups and downs for both of us. “It was fairly obvious he listened to me at the back end of last year and the support I’ve had in terms of the signing of the new players is exactly what was needed. “I’ve nothing to moan about now in terms of what’s happened this summer. “We have a strong squad, perhaps the biggest and best I’ve ever had in terms of options so we’re in a great position. “We have a few missing on Sunday, Siem de Jong won’t be involved. Cheick Tiote, Davide Santon and Ryan Taylor and Papiss Cisse are out. “There’s no way we could have coped with that at the back end of last year or even two years ago but this year I think we can. Newcastle fans would still like to see more business done, although it would seem players would have to be sold, Hatem Ben Arfa or Steven Taylor for example, for more new faces to arrive. Pardew added: “I don’t think we’re short of anything because if I look at my roster it’s full up. “I actually don’t hve a spare place on the roster. Ideally managers always want more players they always want more quality, but I’m not going to bemoan where I’m at. “We have good strikers in the building, but in terms of us in the transfer market it’s not something we’ve completely given up on. “We’re still looking at it and we have our finger on the pulse and we’ve done that very well this summer. “Myself, Lee Charnley and Graham Carr have known about every transfer which has gone through and been involved in everything which is in our ability to bring to the club. “You have to understand the gulf is becoming bigger and wider and the new rules Uefa have brought in for Fair Play are only going to help the bigger clubs and that’s been proved this summer.